Download owners manuals for Prestigio MltiPhone you can here. Prestigio - brand digital electronics holding ASBIS - navigation systems (GeoVision), car DVR (RoadRunner), tablets (MultiPad), smartphones (MultiPhone), electronic books (MultiReader), and peripherals for PCs, drives and accessories. The company claims that its products are represented in 70 countries around the world the following regions: CIS countries, Central and Eastern Europe, Middle East, North Africa and South America. Headquartered in Limassol (Republic of Cyprus). The founder and ideologist of the brand Prestigio - Cepgey Kostevich, president of a distribution company ASBIS Group. Director General of Prestigio - Yuri Antoshkin. Prestigio Company entered the Tablet PC market in 2011. In the first half of 2013 was the Prestigio, Fast-growing brand in the Russian market sales of tablet PCs. According to the newspaper "Vedomosti", the first half of 2013 Prestigio brand entered the top 3 supplier of tablet computers in Russia, the end of 2013 Prestigio is firmly entrenched in the top 3 leaders in sales. 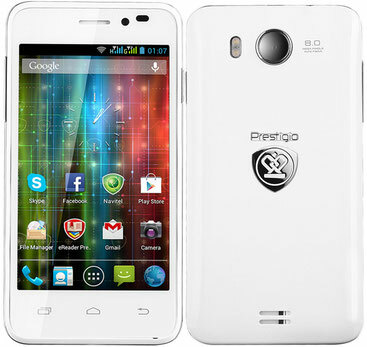 Since 2012, under the brand Prestigio made smartphones on Android - MultiPhone line. To date, the line has more than 15 models. Smartphones represented in all price segments with a diagonal of 3 to 6 inches. Most models have a slot for two SIM-cards. From 2007 to present Prestigio GPS-navigators market in Russia. According to the market research institute GfK, in 2012 the market share of Prestigio PND on the Russian market amounted to 28%. For comparison, accounted for 9%, in 2010, in 2009 the share of the Prestigio - 21%, and in 2011 - 26%. Lineup navigators Prestigio includes classical GPS-navigators, navigators with built-in video camera (hybrids), navigator with built-in TV and navigators under the operating system Android. The total sales volume of navigators Prestigio from 2010 to 2012 amounted to 1.5 million copies. In 2013, "Odnoklassniki" social network analysts have recognized the most popular brand Prestigio GPS-navigators. Since 2010, automobile video released under the brand Prestigio. As of February 2013 line of video recorders Prestigio Roadrunner includes 9 models, including compact models with HD-shooting, Full HD recorders and models with the ability to use as action-camera. In 2011, the Prestigio brand is among the top 10 leaders of the Russian market in terms of volume of sales of electronic book readers in general and in the top-8 place - among the suppliers of electronic readers with TFT-display. Current line of e-readers Prestigio has 10 models, including devices with E-Ink displays and TFT.